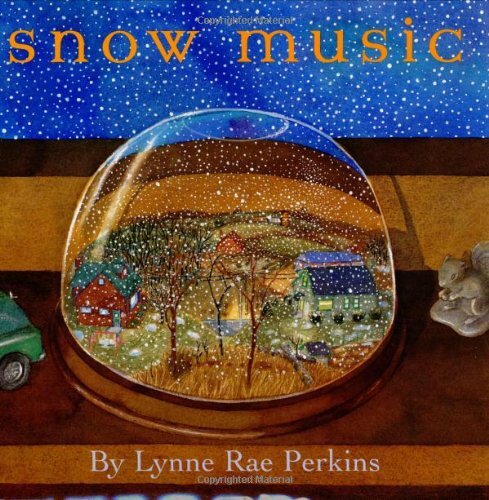 There’s a warm pattern on the title page of Snow Music, representing the comforting wallpaper of a little boy’s bedroom. But then Perkins jumps immediately to cool colors with a remarkable pattern on the next page of blue, aqua, and purple. “Everyone whisper,” writes Perkins, before the story has even started. And then she offers a gorgeous illustration of globs of snow falling in the light of a distant streetlamp. “Soft as our nests when day has gone, snow came singing a silent song.” As the rhyme snakes across a two-page spread, Perkins peeks into the warm dens of rabbits, birds, and mice. But the rhyme suddenly ends when there’s bright white snow blanketing the neighborhood in the next amazing illustration. “Oops,” she adds on the next page – as a little boy’s dog rushes out his front door. She’s playing with the structure of her story, but she’s also playing with words. Random sentences appear, in an almost accidental rhythm. (“What is the sound of one bird hopping? Does the deer feel the cold of the snow in her hoofs?”) The right page shows a squirrel’s footprints curving in a trail, while the facing page precedes it with his thoughts. “I think – I think… I think I left it here.” And the plot has already started, though its characters remain vague and abstract. “You say something like, Hi. I say something like, Hi. Have you seen my dog?” The sentences curl around a page, matching the pattern of the characters’ own footprints. And on the next page there’s a staff of musical notes – except the notes are replaced by four jingling dog tags. A car drives by, and its sound appear on the staff – parallel to the trail of its tires. The next page offers “Truck Song,” but then there’s a bunny in the yard and a bird on the fence. The plot only continues through the window in the background.